BORIS Johnson is the one candidate for the Conservative Party leadership who has a chance of delivering a clean Brexit. Unlike his erstwhile Brexiteer colleagues David Davis and Esther McVey, who have weakly and incomprehensibly caved in – just as the Robbins/May plan assumed they finally would, were the thumbscrews tightened hard enough – Boris has decided to stick to his principles and is refusing to be ground down by May’s relentless and cynical Remainer bullying. 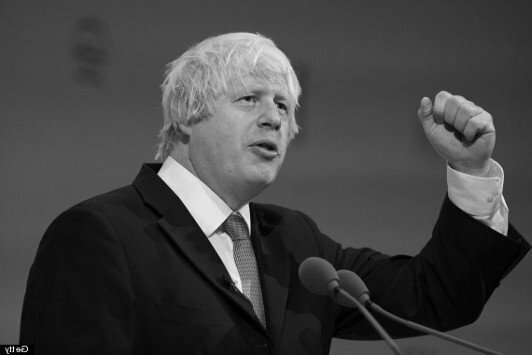 It has taken him a while, but Boris seems, finally, to have arrived at the appalling implications we at TCW have seen for some time – that the Withdrawal Agreement is not a deal but a suicide note. On Monday Johnson wrote: ‘Every single important issue is still up for negotiation; and whether by accident or design, the UK will enter the second phase of the talks – if this deal goes through – in a position of almost unbearable weakness. We will have handed over huge sums of taxpayers’ money (far more than was necessary) for nothing in return. We will be legally and politically at the mercy of Brussels, since we will be obliged to accept all EU legislation, during the so-called implementation period: the first time since the Norman Conquest that a foreign power has passed the laws of this country. This was Boris at his uncompromising best. While nothing had changed in the substance of the WA since the two total rejections in the Commons, what he’d just witnessed was a Government ‘willing to torch its own negotiating capital’, Cabinet ministers merrily flouting a three-line whip and Olly Robbins’s plans to bully MPs by ‘making them believe’ in the threat of a 21-month extension. Why others as intelligent as Norman Lamont have succumbed to this false choice EU pincer strategy and joined the soggy half-hearted erstwhile Brexiteer cadre, led by Graham Brady of the 1922 Committee, is hard to compute. There is little secret about the ‘no Brexit’ it really means, as decisively revealed by Sabine Weyand, Barnier’s deputy, who told ambassadors that the Withdrawal Agreement ‘requires the customs union as the basis of the future relationship’ and that the EU will ‘retain all the controls’. Yet even Jacob Rees-Mogg has allowed himself to flirt with the catastrophic option of bowing the knee to Baal: ‘There is a hierarchy: no deal is better than Mrs May’s deal, but Mrs May’s deal is better than not leaving’ he said, which can only be taken as a hint that he could back the WA. All of which has left Boris Johnson to emerge as the one reliable ‘leadership’ figure to see clearly through this deliberate set-up of confusion and panic. He’s committed to rejecting the WA and demanding an end to the May/Robbins appeasement strategy responsible for the astonishing anarchy and negativity now at the heart of our political class. But where he still has a way to go is hoping that Mrs May at this eleventh hour will start battling for the UK rather than giving it away. She does not have it in her. There is no likelihood at all of her using even a risen-from-the-dead No-Deal default to get the EU to agree to the Malthouse plan. Nor would the EU change heart. May’s strategy is perfectly attuned to the EU and the supremacy of technocratic management over Parliament, the deeper constitutional coup that is part and parcel of the WA which the historian David Starkey has warned of. Now that Downing Street has conceded that we are officially ‘in crisis’, he must be clear and strong as he has never been before. Boris must stand up for a free Britain and be clear what that means; that it means one thing – leaving the EU on WTO terms, not as a default, not even as just the best basis for further free trade negotiations with the EU, but as the only certain route to British liberation. He has one more column to write before March 29. This is his chance to show us what he is made of and take ownership of our departure. Previous articleNo Deal rises from the dead – now’s the time for Brexiteers to sell it!